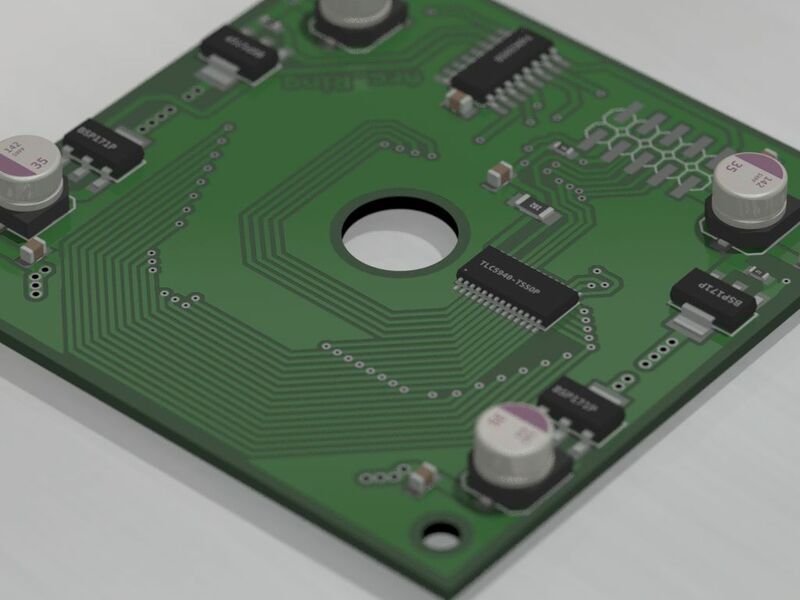 The design features three pcb types that can be arranged to form different "arc"s. Due to the lack of space in the case, all boards are SMD (surface-mounted-device) only. This will likely distract many from building their own arc. But if enough people are interested in through-hole versions of the boards, I will make some aswell. The software and circuit will remain the same, but the size will be larger. 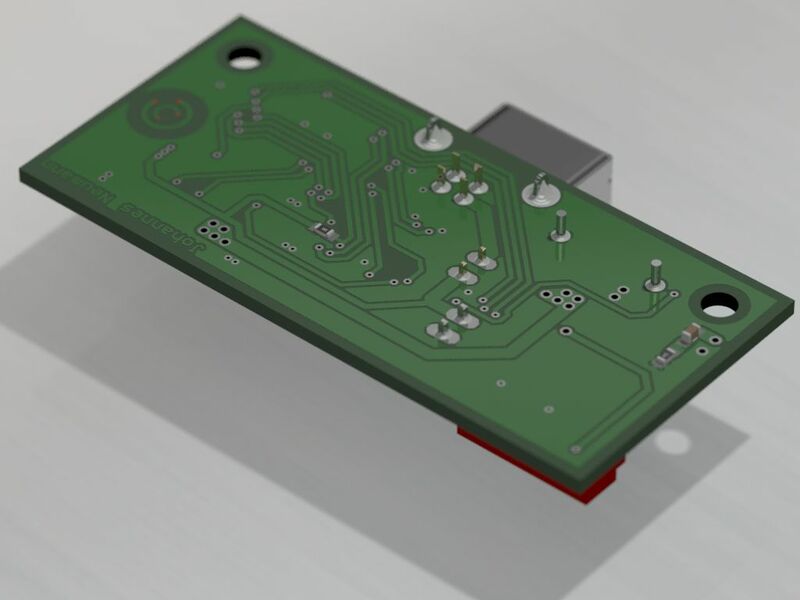 This pcb holds the 64 leds, the mosfet row drivers and the shift register mentioned earlier as well as assisting parts like capacitors to smooth out the power supply. It connects to the base board with a simple 2x5 pin header. In the middle there is a hole for the encoder. The LEDs run from a seperate 3,3V power rail, whereas the logic and driver run from a 5V rail. This is done to increase efficiency, as i will describe later on. 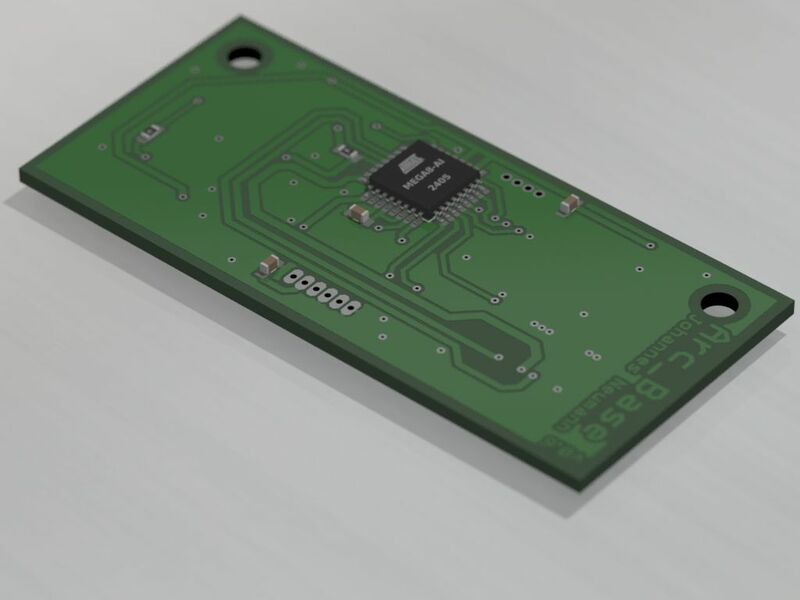 This pcb holds the encoder and the micro controller. It connects to the ring board via a socket and to other base-boards via ribbon cables mounted to micromatch-connectors. Together with one ring board it forms the base for one arc wheel. It has four tiny switches on it to define an adress (4 switches = 16 different adresses). Within one arc device, each board has a unique adress which defines the wheels number. 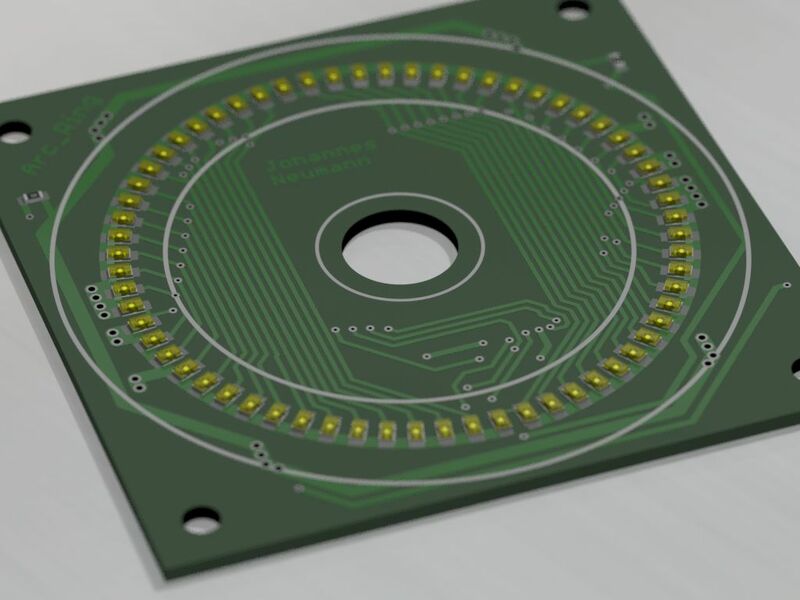 The encoder draws a relatively large current, so it has been connected to a mosfet, effectively allowing to switch it off in stand-by. This is necessary for the USB specifications. Whereas the other boards are needed once per wheel, this board is needed once per device. It holds another microcontroller that collects data from the wheels and passes it on to the computer via an FT245R, which is the same chip that was used for other monome devices. This will allow the clone to run with serialosc just like other monome devices. The USB 2.0 Protocol allows each device to draw a maximum of 500mA from the bus. For an Arc 4 this would mean a maximum of about 1,7mA per led, assuming other parts require power aswell. Now, each led has a forward voltage of about 2V, resulting in 40% of the power dissipated by the leds and 60% of the power dissipated by the TLC5940. This is not good! Scaling the voltage down with a DC/DC converter effectively allows to scale the current up. Assuming the converter is lossless, this would increase the current from 1,7mA per led to 2,6mA per led. Due to the lower voltage, less power is disspiated in the TLC5940 (~40%) and more power is fed into the led (~60%). This will allow to run the leds a higher brightness. 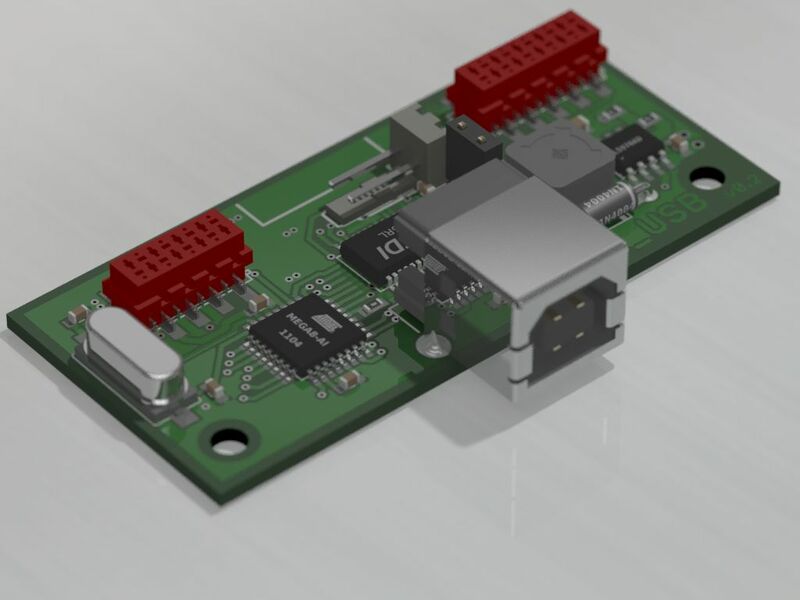 In case, the USB power is not sufficient for the device, the USB board allows to connect an external +5V power supply to power the device.